Coll. No. 1938, 14 June 2018, characters observed: Annual (or short-lived perennial), herb, wet habitats, 45 cm. to 50 cm. ; Hairs, mostly glabrous, except few simple hairs on proximal stem, and margins of auricles; Roots, tap, and fibrous, rooting from proximal nodes; Stem, leafy; Leaves, cauline, petiole, unclear, blade, 50 mm. × 12 mm. wide, lyrate-pinnatifid, tips, acute, spinulose, auriculate, auricles, 1.5-2 mm., margin sparsely ciliate; Inflorescence, axillary racemes, 35 mm. × 7 mm. wide; Flowers, radial; Sepals, #4, 1 row, 0.7 mm., tip, acuminate, color, yellow, glabrous; Petals, 0.6 mm. × 0.3 mm. wide, spoon-shaped, margin, entire, color, yellow; Stamens, #6; Filaments, color, lavender; Fruit, mature, 3 mm. × 1.4 mm. wide, ovate-oblong, spreading, not inflated, glabrous. In Weber & Wittmann (2012), keys directly to R. sphaerocarpa in Brassicaceae Key A at couplet 17, then gets lost at couplet 5 in their key to Rorippa, over the question of whether the plant is erect or decumbent. 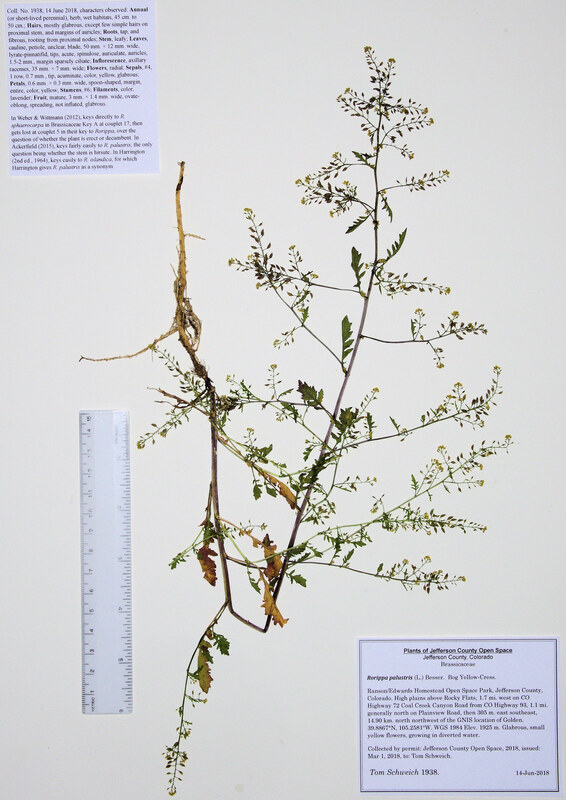 In Ackerfield (2015), keys fairly easily to R. palustris, the only question being whether the stem is hirsute. In Harrington (2nd ed., 1964), keys easily to R. islandica, for which Harrington gives R. palustris as a synonym. Field Notes: Coll. No. 1938, 14 Jun 2018. Other photos about Species - Brassicaceae or Rorippa palustris.